Size tom 1: 8" x 6"
The Tama Superstar Classic Exotic CL72R Java Burst Lacebark Pine is a seven-piece drum set made of 100% maple incl. Stage Master hardware. The special thing about the Superstar Classic Exotic series is that the outer layer of the shell is made of Lacebark Pine and is provided with a noble lacquer. The seven drum shells are made of exquisite Maple and equipped with high-quality shell hardware, such as the Star Mount, the Classic T-Badge and triple-flanged hoops. Due to the thin wall thickness, the Tama Superstar Classic drums produce a warm and assertive sound, which remains in tune and balanced thanks to the accurate 45° bearing edges and the Tama Power Craft II heads. The special feature of the Superstar Classic Exotic is that it is a large drumset with seven shells and hardware package as well as the stunning finish. The outer layer of the drum shells is made of Lacebark Pine, which has an excellent finish. If you are looking for a cheap and comprehensive drum kit with high-end optics for demanding beginners and advanced players, this is the right place for you. The bass drum has eight layers with a thickness of 7 mm and the toms / snare have six layers with a thickness of 5 mm. Apart from the outer layer, only the finest maple is used, the classic in drum construction. In contrast to the Tama Superstar Hyperdrive, the Superstar Classic has the classic shell sizes and no shortened shells. This results in a resonant, deep basic character with a lot of power and assertiveness, which has recognition value. The fine 45° bearing edges in combination with Tama Power Craft II heads guarantee a sensitive response to high dynamics. 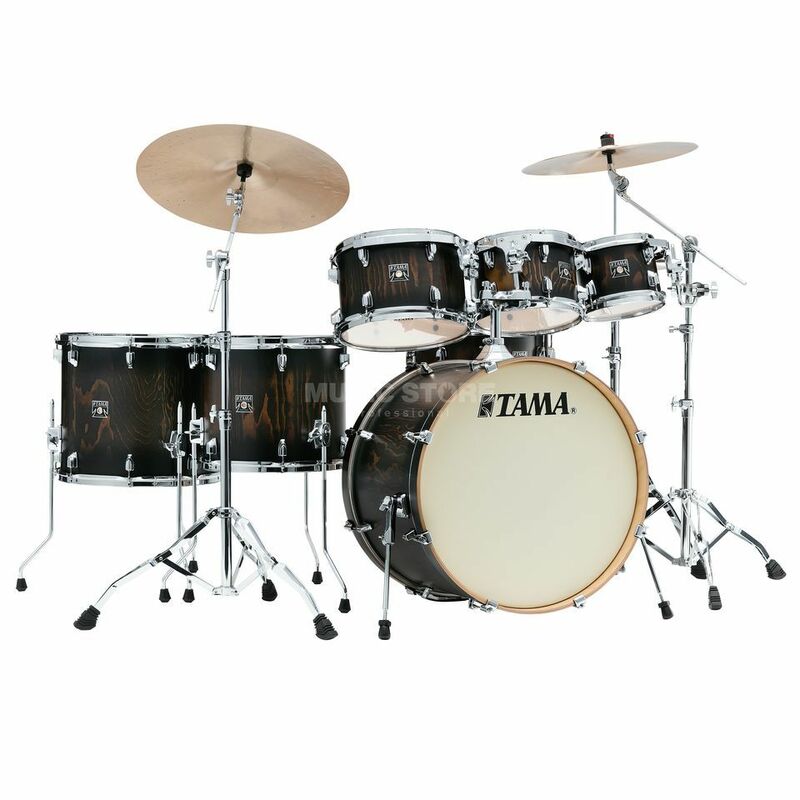 Optically the Tama Superstar Classic shells are rounded off by the high-quality lacquer finish. The Tom-Toms are mounted on the Tama Star Mount suspension, which guarantees free vibration and full resonance. The suspension is mounted at four points on the top of the shell and has flexible wing nuts, thus ensuring ideal access during assembly and stepless alignment of the shells. The rubber-backed Low Mass Lugs and the classic Tama T-Badge have been adopted from the old Superstar series and make the Tama Superstar Classic Drumsets an optical highlight with retro charm even in their modern guise. With the many professional features and the high-quality drum shells, the Tama Superstar Classic drum kit is almost unbeatable in its price range and a real alternative for professional drummers who need to pay attention to their budget. Size tom 2: 10" x 7"
Size tom 3: 12" x 8"
Size floor tom 1: 14" x 12"
Size floor tom 2: 16" x 14"
Snare size: 14" x 6,5"
Size bassdrum: 22" x 16"